The Hewlett Packard Mini 2140 Notebook PC is the most recent upgraded addition to the HP Mini-note line of netbooks. The device weighs only 2.6 pounds but sports as much basic computing power and performance as any student or teacher would need in a classroom. 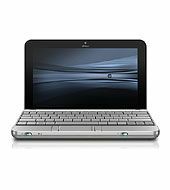 The brushed aluminum-clamshell case protects a 92-percent full-size QWERTY keyboard and 10.1-inch diagonal HP Illumi-Lite LED display. The screen supports a 16:9 aspect ratio, similar to those of many newer TVs, and you can choose between standard and high resolution. The integrated VGA webcam enables video and still-image capture built into the top of the open clamshell. Pros: The performance upgrade from the HP 2133 Mini-note is obvious. The enhanced resolution and stereo audio were immediately met by oohs and aahs from the student reviewers. The keyboard is also the most comfortable of those on the netbooks T&L has reviewed, which makes this the best device for older students and the best personal professional device for teachers. The device feels durable to the touch, and while we didn’t perform any spill tests, the HP DuraKeys finish (a clear coating applied over the keyboard) should give added protection against any cafeteria accidents. Cons: Compared with some of the packaged education applications that come installed in competitive products, the vanilla Microsoft’s OS options are limiting. The price point may be too high for some schools and districts as well. Overall evaluation: This device would make a terrific one-to-one solution, especially for high school students. Its performance and multimedia features would work even for students graduating and moving on to college. The netbook could also do double duty as a mobile presentation device for classrooms. Retail price: starts at $449.